Celeste Keller is a portrait painter dedicated to capturing specific moments she recalls with the people closest to her in her life. She paints family members, close friends and people she is directly connected with. She aims to create a contemporary time capsule, a futile attempt to stop time rushing past, where her subject gets to stand still, to be in his/her moment, whatever that may be. Celeste Keller lives and works in Toronto, Ontario. She received her BAH in Fine Art from the University of Guelph. 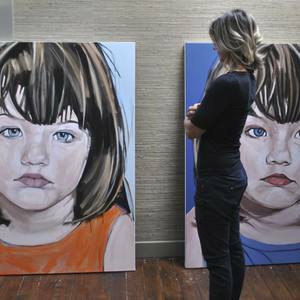 In 2010 she was featured on the Bravo TV series 'Star Portraits' where she met and painted Mike Holmes, Canada's beloved Contractor. Her work is exhibited locally and collected internationally.